her lines are my "Jimmy Choo" of nightstands..
so I thought " oh why not "
Have a beautiful week ladies!!! Love your style! Sooo pretty. Looking forward to catching up on some of your other posts. Come say hello at A Shabby Moment in Time. I'd love to hear your thoughts. you've got it goin' on girl in a way none can compare. don't tell anyone, but I can redesign "normal" nightstands to look just that. I did not know that you have lupus. My sister and my neice both have lupus. It is such a difficult disease. Is it pretty manageable for you? Your spaces are always so beautiful, Kate. Love the headboard, divine. Great Jimmy Choo nightstand, so curvy!! Lovely Kate! Love all the chippy goodness! I hear you on wanting a nice, pretty place to recoup when you aren't feeling well! I have the same pillowcases in my guest room so obviously we both have great taste! :-) Awesome pics as always! I love love love the headboard! All looks so great! Hi Kate...love the way you have layered the mirrors over the shutters! Everything looks so pretty! Hi gorgeous. As usual, I love everything you touch :) Hope today is finding you smiling and feeling well my dear!! Hi Kate! Your incredible gift for styling and staging is "To Die Over"!! I so love that fabulous headboard and those shutters...OMG!! Jimmy Choo's! "Beautiful Post Kate"! This all loooks pretty exciting! Love the frenchy nightstand too! So nicely arranged and fun to look at. I think we would all knock eachother over to get that nightstand.......it is fantastic! Your pictures are beautiful! Have a great week Kate. Kate that was such a lovely post! I adore that mercury glass bottle! Your bed looks SO inviting and soothing. HUGS! Kate ~ your posts are always so very pretty and creative and thought-provoking! I love that headboard on your bed! The chippiness, the textures, and the soft colors you use in your home are just beautiful! I love the use of shutters in your home. I was at an architectural salvage place over the weekend and they had many many shutters. I couldn't think what I would need them for...but looks like I might indeed need them. Great post. I like that chair too. Your bedroom looks very soothing and calm to me. Hope you are doing well. You'll be the first to know if I make a trip down to Cali girl. Not sure when that will be though.....hopefully sooner than later. I really want to get to Rose Bowl. Your house is so beautiful! I am in love with that "headboard." Just over the moon in love! Kate, I had to come back and admire your vintage alarm clocks. I have a little collection of 3 but would love to add to it. Yours are so pretty! Thanks for inspiring me, I'm going to go scour etsy for another one! Thanks for sharing on White Wednesday! Stunning! All of it; absolutely stunning! Everything is beautiful Kate! 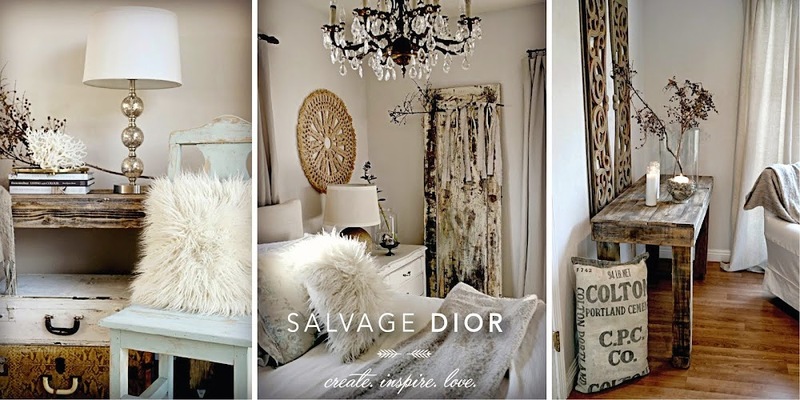 You are the master of lovely salvage decor! I love how you layer pieces together. It's breathtaking! So pretty! LOVE that door headboard! And those shutters.....lucky find! They are getting really hard to come across here....unless they are plastic!! LOL! Hope you are well and having lots of sunshine....please send some our way!! I love love love that blue chair with the nailheads. You have a very special touch! I really love your blog:I'll be back.